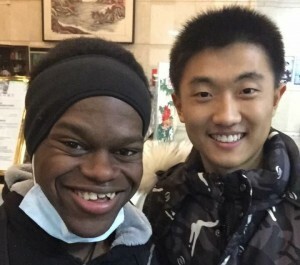 Meeting my partner Fan Yun was life altering. He expressed very sensitive topics to me and helped me understand just a piece of his life. We learned that we are both very open-minded and aware that we completely express the emotions that we feel. 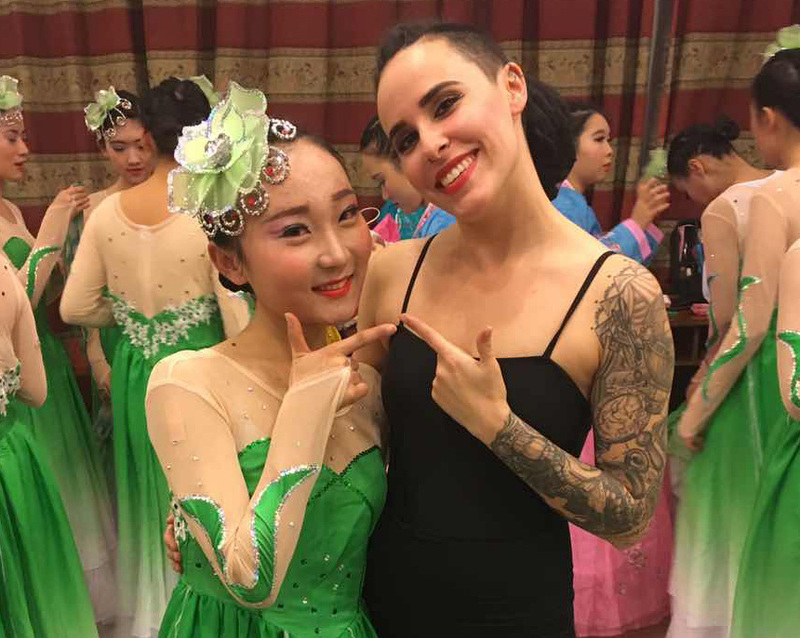 Although we live very different lives, we still connected with one another—and that is why it was so hard to leave. I was very emotional when leaving China because I knew how some of the students could not express themselves fully due to their culture. It truly saddens me that some people do not have full control over their happiness. But I enjoyed every minute of China, and I cannot wait to go back. A number of Chinese students lined up to have their hair braided by Kim. Braiding was a new sensation (and a bit painful) for the students, but they marveled at Kim’s technique. What an amazing first trip to China! 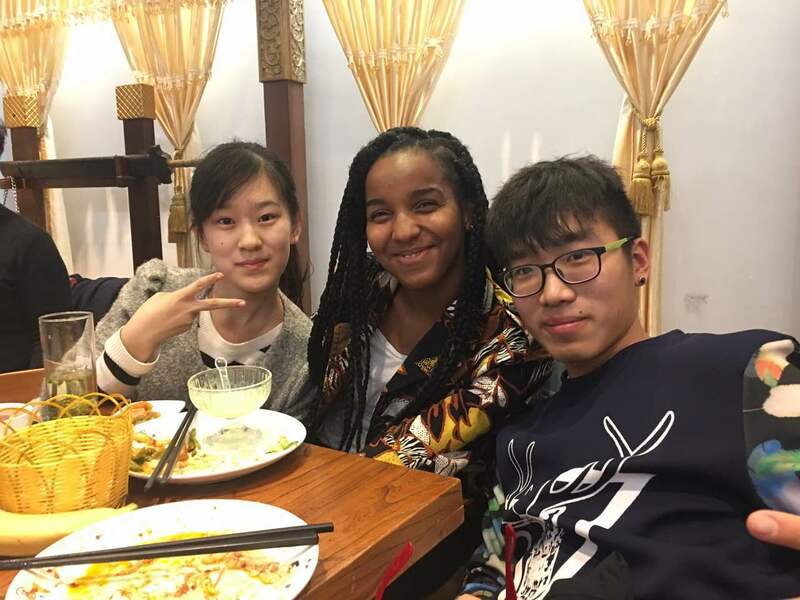 It gives me great joy to know that the China students were just as excited to experience American cultural as we were to experience Chinese culture. I thought to myself, “How can they appreciate arts and culture as a force for good?” I was striving to be enriched, while seeking to reach out, touch, communicate, and bring the students together to experience the African diaspora. I had an “ah-ha” moment. I could braid their hair as a cultural exchange. The CUMTB students wanted to experience hair braiding. I gave them a history lesson on braids. I told them, “Hairstyles come and go, but braided hair is an ancient beauty technique, with a long and literally winding history that roams across countries, cultures, and centuries. In modern times, hairstyles aren’t so serious but one thing hasn’t changed: braids are cool.” I put one braid in each one of the students’ hair. They felt a little tenderness, pain, and tightness in the braid. But as time went on they became accustomed to the braid. They kept it the next day. They stated that the other students loved it, and they wanted a braid too. What a great exchange! My partner HJ was the best partner I could have had. I was worried that she would be shy, but she was the opposite. The day the students took us shopping was crazy, but HJ made sure that everyone was keeping up and was leading the way. She’s an English major, so her English speaking was really impressive. She helped translate some for me and the other students. Her personality is very inspiring to me, especially with her leadership skills. Her dancing abilities were off the charts as well. She had a strong presence, and I felt like her and I meshed well. I told her one day that I found her to be a “boss.” She didn’t really understand, but I explained that she was someone that got her work done and did it well. It was sad when AADC had to leave. I just wanted to take HJ back with me to the U.S. 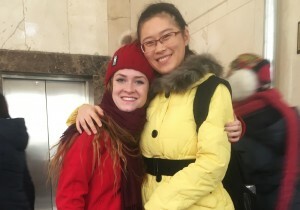 I honestly feel honored that she was my partner during the cultural exchange. 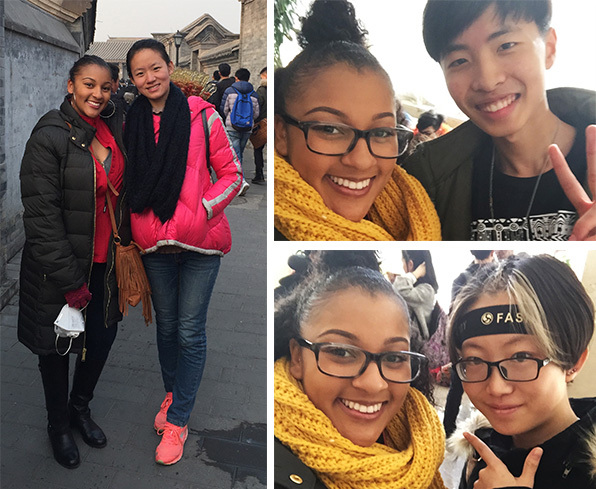 Jalyn with her Chinese friends Xia Xue (left), “Swaggy” (top right), and Andrea (bottom right). My Chinese partner, Xia Xue, was not feeling too well the week we were in Beijing, so unfortunately she did not make it to many of the events with the other CUMTB students. I got to spend a little bit of time with her on Sunday after our lecture demonstration. We took the subway to a traditional Chinese market. She and one of her friends, Gloria, walked around with me to see the many souvenir and antique shops there. However, we were only able to connect via WeChat from that point on. For the rest of the trip, I mingled with some of the other dancers’ partners. I really connected with a girl who introduced herself as Andrea and Savasia’s partner, whom we all ended up calling “Swaggy.” I was able to learn a lot about the Chinese culture and CUMTB from them. They were also both just so sweet and open to discussing their lives and cultural experiences, which is why I think I enjoyed talking to them so much. My experience in China honestly wouldn’t have been nearly the same without them. Developing those friendships really helped me engage and immerse myself in the Chinese culture. They took me in, made me feel welcome, and almost like I was one of them. I never felt like a tourist or stranger when I was around them. I’m still shocked by how quickly I was able to bond with some of the students from CUMTB. I actually cried when it came to go. I am really going to miss them. Hopefully this is not the end of our cultural exchange. I really want them to be able to travel to the U.S. and gain exposure to our culture. I would love to have an opportunity to host them at IU! I had two partners in China, Crystal and Jason. I met Crystal first when she welcomed me at the airport. Crystal was shy from the beginning, and we struggled to communicate. I spoke too quickly and talked about things she didn’t understand. I met Jason when we arrived at the hotel. I quickly realized he was outgoing and spoke more English. He was the president of the dance group, so that explained his personality. Both of my partners we very nice. Crystal just loved to be around me. We took a ton of selfies and mostly talked about school or dance. Jason was known by the whole group and was easy to get along with. I loved getting to know my partners and learning more about China through our conversations. This trip would not have been the same if I hadn’t met my CUMTB partner Zhang, or as he’s known by his English name, Bob. While we didn’t get to spend much time together, all of the times we did were wonderful. Whether it was hanging out at karaoke, learning how to play Mahjong, or discussing culture on the way to McDonald’s, Bob knew how to have a good time wherever he went. He’s genuinely a fun and funny guy! His present to me was a tile with a wanted poster of his favorite TV character he had designed. Knowing how much work he put into it and how much it meant to him makes it that much more valuable, and I will cherish it forever. Hopefully he enjoyed our time together and my present to him just as much! 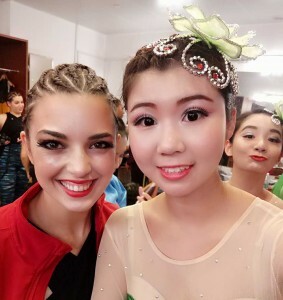 The first time I met Jingyao, she was super bubbly and excited to meet all the dancers. She came up to me after the lecture demonstration and wanted to take lots of pictures. Later that day she and some of her friends took us to the mall and then to a traditional Chinese street market. We went on the subway, and she held me by the arm the whole way so I wouldn’t get lost! She seemed so happy to show us around Beijing. Then at the tea ceremony she gave me a beautiful traditional purse, and we talked a lot about Chinese and American culture. It was so great to meet her and spend time with her. I will miss her so much! Having CUMTB student partners transformed our experience as a group. In my past experiences traveling with a group of people, our primary mode of processing our experiences was with the group. This would normally mean our interpretations were more insular or processed with an outsider’s perspective. 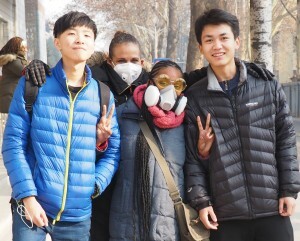 On this trip, our primary mode of processing was with the Chinese students. This helped me process all these differences more immediately with a local person my age. It’s a lot harder to be uncomfortable in differences when you experience them through a local’s eyes. When the dance company did get moments to process together, we were mainly sharing stories that students had shared with us. From here on out, I think I might try to find someone to be my language/cultural partner if I travel. It’s so much better to travel not only to new places, but also to new people. Camille’s partner, Jason, participated in a dance class with AADC. The CUMTB students are absolutely amazing. They are all so attentive and willing to learn about social and political issues in the United States. Even though some words and phrases we used they didn’t know in English, they were patient enough to allow us to explain, and if that didn’t work, they were ready with a translator. I am especially thankful to be able to be paired up with Jason. He is an incredible person who is really kind and dedicated to his school work, which I admire so much. Although it was sometimes difficult to communicate, he made it work, and I’m so grateful for that because I would have been lost without him.